Random House Trade Paperbacks, 9780812975222, 320pp. Lisa See is the New York Times bestselling author of Snow Flower and the Secret Fan, Flower Net (an Edgar Award nominee), The Interior, and Dragon Bones, as well as the critically acclaimed memoir On Gold Mountain. The Organization of Chinese American Women named her the 2001 National Woman of the Year. She lives in Los Angeles. Visit the author’s website: www.LisaSee.com. First and foremost, Peony in Love is about love. What are the different kinds of love that Peony experiences? How does Peony's love for Ren change through the years? Have you had similar experiences in your life? In what ways is mother love explored? How does it change from a mother's or daughter's perspective? Do these things still hold true for mothers and daughters today? 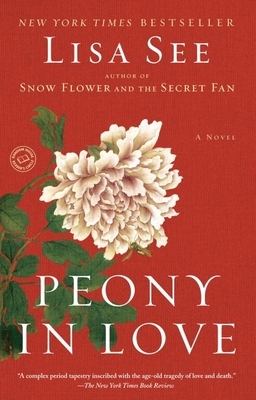 What does Peony learn about mother love and in what ways does she experience it herself? One thousand years ago, the poet Han Yun wrote, "All things not at peace will cry out." What do you think he meant by that? And in what ways does this inspire Peony and the other women writers in the novel? In what ways does Peony long to be heard? Do you think women today are really heard for who they are? In what ways have you tried to be heard? What are the parallels between the lovesick maidens and girls with anorexia nervosa today? We see a difference in Peony's actions after Ze marries Ren and again after Ze dies. Do you see redemption here for Peony? Could you sympathize with Peony's actions in the years immediately following her death? Which of the three wives do you sympathize with the most, and why? What are the differences and similarities between the Chinese afterworld and western concepts of heaven and hell? Which seem better? Which would you prefer — for yourself and for your loved ones? How does what happened during the Cataclysm change depending on who's telling the story? How do Peony's experiences as a living girl and then as a hungry ghost parallel Liniang's experiences in "The Peony Pavilion"? In what ways do you feel Peony's eyes were opened to the reality of her father's real character? Compare the actions of Peony's mother and grandmother after they meet in death with their actions when they were alive. Peony in Love shows the strength of women and women's companionship, but in what ways does it also show the dark shadow side of women whether in the women's chambers, between a mother and daughter, between wives, or even between friends? The novel looks at the Chinese veneration of ancestors as well as the desire to have sons. How are these two beliefs connected? Lisa has written before about footbinding. What's the importance of footbinding in this novel? What does Peony learn about life and love through her experiences of footbinding? What do you think caused the change in Peony's ability to assist in footbinding? What role does the plum tree play in the opera of "The Peony Pavilion" and in Peony in Love? How are jealousy and envy addressed in the novel? Were you surprised to hear about the women writers in China in the 17th century? Do you think it's important that we know about them today? Compare the roles of women in China in the 1600s to the roles of women in the United States in the same period.